Here is our collection of altar photos, scroll down to see what other visitor's have sent in for our photo gallery. 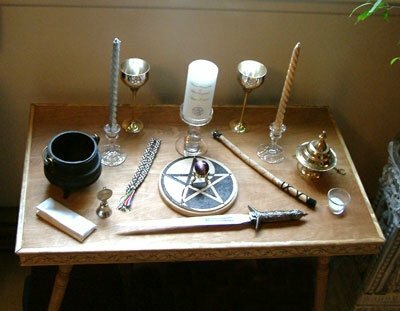 They are listed by title under the "Other Submitted Altar Photos". You can also add one of your own if you have a photo you're proud of. Want to share an altar photo? Is your altar a thing of magickal beauty? Share a photo with the rest of us and give us all a little more inspiration for our own sacred spaces. This is the little yule altar I put together. It is rather simple, but I like simplicity and I wasn't home much during the Holidays. Just a sample altar pic to get this collection started.